What is a garage? In modern American houses, it’s supposed to be a place to store the car, although in many homes it’s too full of other stuff for the car ever to fit inside. Tools, Christmas decorations, washer and drier, suitcases, garden equipment, stuff you plan to give to charity someday, and stuff you just plain don’t know what to do with live in the garage. At my house, it’s also where I store: pellets for the pellet stove and kindling for the wood stove, a spare tire, tire chains I have never used but must carry in the winter, my husband’s old bike that he never used, two dollies, three ladders, an umbrella for the patio table that fell apart ages ago, a Shop Vac, an American flag hanging above a Christmas tree stand, a few dozen empty boxes, two bags of Styrofoam “popcorn,” a file cabinet that didn’t fit in the house, and a nearly lifesize image of my late husband signed by all the folks at one of his many retirement parties. We call it Styrofoam Fred. But yes, I do get the car in. Thank God it’s small. My single-car garage is very garage-ish. Cobwebs in the single-paned window, bare-wood walls, electric-powered door that rattles in the wind, bugs traveling freely through, mouse droppings in the corners, cold, stained concrete floor. When the door is open, everything is exposed to the world. It’s not the kind of room you’d like to live in—unless you’re a mouse. But here’s the thing. The current garage is an add-on. The original two-car garage is now my den. In the wake of the great water heater flood of 2013 (see earlier posts), the bookshelves and carpet were ruined. For the last three weeks, I have been living with a den that more and more feels like a garage. Yes, it’s got sheetrock which I lovingly repainted two years ago. It’s got curtains, carefully matched furniture, and closets all along one end. I was so proud of that room, the one room I felt I had finished. But you know what? It’s still a garage. Behind the soggy sheetrock is bare wood. Behind the wall-hanging I made of felt and crochet hangs the fuse box. Under the Berber carpet was concrete, stained, pitted, cold and hard. Ants travel the edge of the southern wall like it’s a freeway. My sofa and TV sit like islands in a hard gray sea. The former owners turned the garage into a den in 1990, eight years before Fred and I bought the house. They had four kids, a dog and a parrot; they needed the space. I don’t. I have often thought I’d rather have the house a little more compact and use the garage as a garage, but it’s too late for that. Unless the gradual westward settling of our land here eventually sends it into the ocean. Post-flood, my beautiful den/library has been mired in insurance-hired service providers. Three guys came out and dried the old carpet for several days, then ripped it out. They tossed my bookshelves into the front yard. Last weekend, my neighbor got tired of looking at them and burned them in his fire pit, causing another neighbor to complain about the smoke. I have new bookshelves ordered and I’m waiting for a sample of my old carpet to be analyzed Back East so I can find out how much State Farm will pay for new carpet so I can finally order it and get it installed. Meanwhile, today, guys are supposed to come out and patch the hole the first guys chopped out of my wall. And then they will paint it. But the drywall will have to dry first, won’t it? And I don’t have any more matching paint. It’s a slow process. I currently have mountains of clothing from the closets and approximately 600 books all over my house. 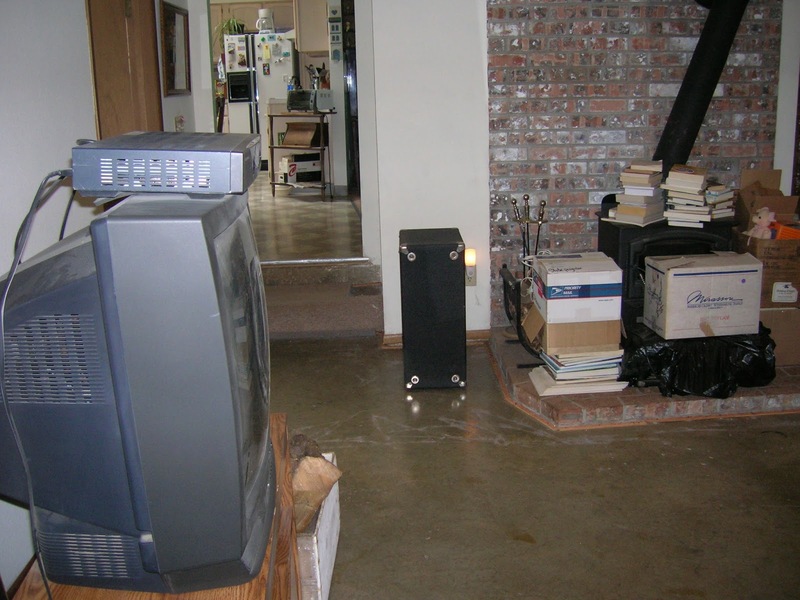 I had no idea that room, that garage-turned-part-of-the-house, held so much stuff. I don’t plan to put a single thing back without reconsidering whether I need it. Meanwhile my guest room bed is buried in clothing, books and musical instruments, but you’re welcome to sleep in the garage.